Being Joyful on Purpose (Despite Neighbors and Old Cars)! 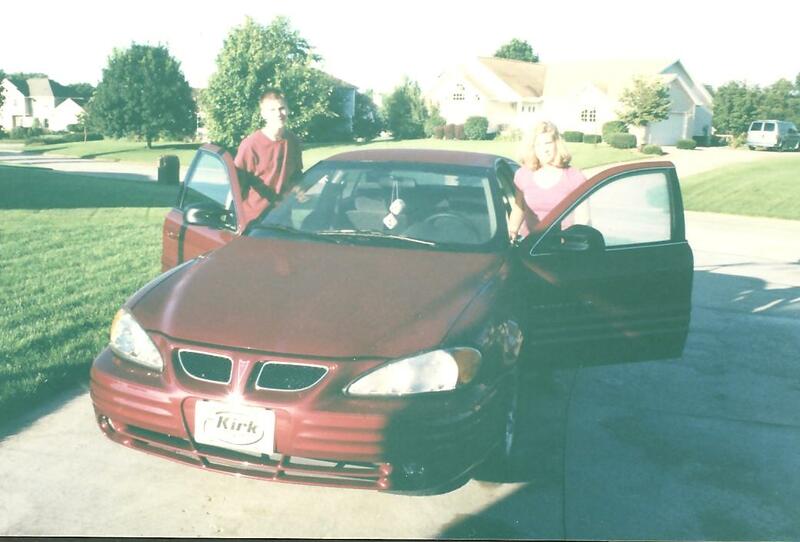 First day of my senior year of high school with my new car! My bro was a lucky freshman who got to ride with me instead of on the bus! Some days I want to move. I want to live in a neighborhood where people don’t park their cars in the front yard. I’m sick of fixing one thing after another on this house. I’m tired of vacuuming every day because my pomeranian’s hair is all over the place. I can’t wait to buy a new (to me) car. One where the dashboard isn’t curling up from years of being parked out under the sun, the side door doesn’t have a dent from accidentally scraping against a fire hydrant, and the front passenger window isn’t taped up to prevent it from sliding down due to some weird electrical issue that’s been fixed twice already. I wish I had more money. Not an obnoxious amount – just enough to feel like an unexpected crisis is going to put us back to square one of rebuilding our emergency savings. And enough to buy a decent used mini-van or SUV when my 13-year-old Grand Am decides it’s been driven too many miles. I’m sure I could go on about all of the things that are lacking in my life and complain about from time to time, but I’m going to choose not to because I prefer (most days) to focus on the many blessings I have in my life – the special relationships, priceless moments, and undeserved gifts. Just last evening alone, I experienced so many blessings. After work, I went to my parents’ house to pick up my daughters from an afternoon swimming lesson at their pool. My parents had just made dinner, which was perfect because I was hungrier than usual and was afraid that if I didn’t eat soon my patience would wear thin with the girls. When I sat down to join everybody else who was almost done eating, my two-year-old reminded me to pray! So cute, as she’s just learning to make the sign-of-the-cross and say grace before meals right now! On the way home, my husband called to FaceTime with my four-year-old. Every night that my husband works, they always communicate via FaceTime before she goes to bed! And each night, including last night, “C” won’t let him off the phone until they both kiss their screens at the same time and hug their phones. Can you say A-D-O-R-A-B-L-E?! And if that wasn’t adorable enough, when I walked into “C’s” room to get her ready for bed I found her standing at her dresser with her hands folded looking at a framed photo of her Daddy holding her when she was a baby. I asked her what she was doing and “C” said, “I’m praying for Daddy.” I asked her what she was praying for and she said, “I’m praying that he comes back to me and I want him to know that I’ll always love him.” MELT MY HEART! It was the sweetest thing I’ve ever seen in my life! After precious cuddle time and big kisses and hugs, “C” and I even peeked out the window to watch the fireflies before she fell asleep. Then, later in the evening, I received this text from my husband- “Thanks for loving me :)”. These moments refresh me and make the vocation of marriage and raising a family so joy-filled. It may seem like just an average night, but how sad it would be if I were to dismiss and overlook all of these blessings! Maybe I paid extra attention to these moments last night, because on Wednesday afternoon a beloved longtime co-worker lost her husband to a massive heart attack. It’s times like these when our priorities are really put into perspective and we cling a little tighter to what who matters. I want to be able to look back some each day and feel grateful that I soaked up precious time with those I love and didn’t hold anything back. I want to know that I sacrificed, gave too many hugs to count, said “I love you” a million times, and brought joy to others because I lived my own life joyfully, on purpose. I love my house. I love that we live in a nice town so close to the lake, several parks, and my parents’. I love that my girls have nice rooms and warm beds to sleep in. I love that we have a finished basement with plenty of room for them to play and my husband has his own studio. I love that we only have one full bath – one less shower to clean! I love that we have a fenced-in backyard for Princess. I’m grateful that my car has lasted this long. It was paid for by my parents and despite several cosmetic weaknesses, it has ran great which is what counts the most! I’m thankful that God has provided what we have needed. It seems like anytime we get a bonus or some extra money, it goes straight to pay for a repair or a medical bill, but I know that is just what we needed at the right time! I’m thankful for our jobs. My husband and I are able to spend as much time with our young girls as possible and still provide for our family’s needs. We’ll never be able to get this time back with them and we know how much every moment counts. A thankful heart is the key to joy. And this joy is all because of Him! Have a great weekend, and live life intentionally TODAY! *This post is part of the Catholic Blogger’s Network June 2013 Link-Up Blitz. ← 5 FREE Father’s Day Printables! I just love love love this! What a beautiful family and life you have – and how blessed you are to realized it!